Mrs. Mollie Jeffrey - Quoin Hill Border Leicester Stud, Founded 1936 Flock No: 770. Phillip Island, Vic., with Graham taking delivery of the Ram purchased at the October, 2015 - Retallack Sale. This son of Retallack Double Dipper, 2015 Canberra Royal, Junior Champion Ram. Lot No. 34 - was the top priced Ram at $8,000. Mrs. Jeffrey, is now 99 years old has purchased rams from Retallack, for over 40 years (many have been the top priced Ram of the sale), sells her rams privately. Molly also operates and owns a Merino Stud, together with her Border Leicester Stud, producing 1st X Ewes and 2nd X Lambs, as well as Hereford Cattle, on her three Phillip Island properties, with now four generations of the Jeffrey family involvement is under the guidance of this wonderfully grand lady. Retallack displays at the Elders Sheep and Wool Expo, Deniliquin 2013. Top Price Border Leicestor Ram "Retallack 635.10"
Graham & Isabella Grinter were absolutely thrilled with their 31st On Property Stud Sale [See full sale report]. Adding to its extensive achievements in the show ring, Retallack Stud was this year awarded the H.P. McKenzie Perpetual Challenge Cup at the annual Australian Sheep and Wool Show, in Bendigo. This prestigious trophy, which has been awarded since 1946, goes to the Most Successful Exhibitor from one of the breeds exhibited. This year the Border Leicester breed was selected to contest the Cup, and Retallack principals, Graham and Isabella Grinter, were proud to accept the award. 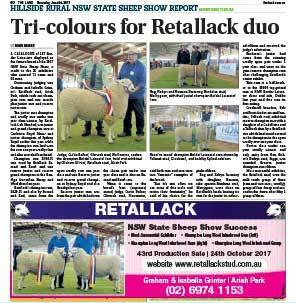 Retallack stud attended the 2009 Australian Sheep and Wool Show, a major event attended by the stud for over 30 years. The ASBA show, which was moved from the Melbourne Show-grounds some 10 years ago, had one of its highest crowds ever this year when 20,000 people passing through the gates. The show ring continues to be our shop front window and we were pleased with the interest shown in our sheep over the three days, from Border Leicester breeder's, managers of other meat and wool breeds, commercial producers and the general public. Elders in conjunction with "Sheep Genetics Australia" & "D.P.I." conducted a "Sheep Breeding Workshop" at Retallack 13/7/2009. 2 What they mean & how they are calculated. 5 Using A.S.B.V's in practical selection. Graham and team members at the weekly Wagga sheep and lamb market, one of the largest sheep and lamb sales in Australia. About 500 people attended coming from Gundagai, Horsham, Mortlake and North East Victoria and surrounding Riverina areas. 37 Studs exhibit their Rams and Ewe and extremely high quality rams were displayed from the top progeny within the Riverina District. There were 15 other displays including several local traders. And the winners were . .
3rd Prize, 150w Arlec Portable Floodlight and Moshi Bassburger Boom Box, donated by Wired Entertainment and Leading Edge Electronics, was won by Katie Harland. 4th Prize, Ladies Body Care Pack donated by Barlow and Weller Pharmacy and a Car Care Kit donated by Deniliquin Toyota, was won by Maria Wardlaw. Thanks to all those who donated prizes, all funds going to the McGrath Foundation.